Today at MWC Alcatel unveiled the first phones in their new Idol 4 line. 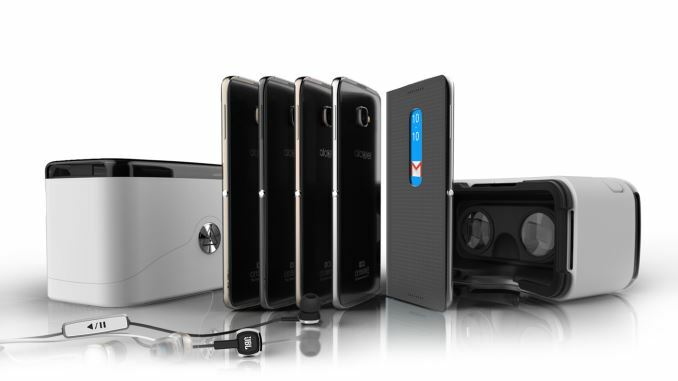 The Alcatel Idol 4 and 4S are successors to last year's Idol 3, and they come with some interesting new additions, including packaging that doubles as a VR headset of sorts to use with the phone. Naturally, both phones also feature some spec bumps and size changes from the 4.7" and 5.5" Idol 3 smartphones. You can see all the known specifications for the Idol 4 and 4S in the chart below. On paper, both phones look like they'll be quite good if Alcatel is able to keep pricing within a reasonable range. If I were to make a guess, I would say that both phones are going to come in above the $250 price of the Idol 3, and the Idol 4S looks like it's really aimed at the higher mid range or even the pure high end market rather than the mid range. The Idol 4S is definitely the more interesting of the two, with Qualcomm's Snapdragon 652 SoC sporting four Cortex A72 cores in addition to four Cortex A53 cores, and being built on a 28nm HPm process rather than 28nm LP which has been used for most of Qualcomm's previous 400 and 600 series parts after the move to standard ARM cores. Both phones have what look to be quite good displays, at least on paper. The Idol 4S is again the more interesting of the two, with a 5.5" 2560x1440 AMOLED display. It'll be interesting to see whether the display is properly calibrated like other recent AMOLED devices. Beyond the display and SoC, both phones are very similar. The Idol 4S does take the rear camera from 13MP to 16MP, and it has a larger battery simply because it's a larger phone, but most everything else remains the same between the two. Something to note is that they're both launching with Android Marshmallow, which is greatly appreciated in a time where many phones somehow still launch with a version of Android that is around a year old. In addition to being fairly good phones as far as specs on paper go, the Idol 4 and Idol 4S have one other interesting feature. Rather than being packaged in your standard cardboard box with some manuals and a charger, the phones come in a special case that is also a VR headset. Much like Samsung's Gear VR and Google Cardboard, you mount your phone inside and can use it for VR. The case looks to be much sturdier than something like Google Cardboard as well, and I'm definitely interested in giving it a try. The 4 is less than you imply. A53 at 1.5GHz (they list 1.7GHz http://www.alcatelonetouch.com/global-en/products/... but Qualcomm lists 617 max clocks at 1.5GHz) is not exactly much anymore.This is not 2015, a new cycle is starting. Lenovo has the K32C36 with 5 inch 1080p, SD616 at 107$ (China pricing). 4 would have been slightly more interesting with the P10 and nice with the SD650. 4s is iffy with pentile but at least it is high res and users will not notice that they are getting fake pixels. Ofc gaming will be a bit lacking but not everybody needs fully fluid gaming. TCL has been a bit lacking in design, they do take a step forward here. Rather tall with the speakers and they rip off the Sony button but , at least, they don't take a huge step backwards like LG, HTC and Xioami. The box turning into Cardbaord is something i've been waiting for for a long while, nice to see that it's spreading. I love to see a idol 4 with the new 625...the smaller battery sacrifice is worth it. The SD625 is second half of the year so will compete with the P20 and others. The P10 goes to 2GHz, has slightly better GPU and is on TSMC's 28HPC+ ,should have nice power consumption. I've also seen an extremely nice phone by a company (formerly Siemens) back at CES, but didn't hear from them anymore. There are lots of other OEMs building just as nice smartphones. I'm looking at the spec sheet on these cuties, and damn. The parts (Screen, DAC, audio amplifiers, NAND, modems, antennas, etc...) are all top notch. In a couple of years, these "midrange" SoCs will be plenty fast for the heaviest of power users. So what will a "true" flagship have that these devices don't?? Brand and image? I really wonder how long Apple and Samsung can milk their brands. Today higher res and/or curved screens can still make a difference. Better GPUs are also a big advantage as resolutions are crazy high and games are still poor. Sure you have lots of other less noticeable pluses in high end (that doesn't mean that any phone is worth 700$ and that some brands can't do 2-3 times lower prices for the same device).